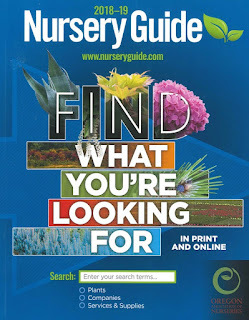 My Oregon Association of Nurseries (OAN) Buyer's Guide came in the mail today and I paged through the members listing to see who is still in business. You can grow and sell plants without being a (paid) member of the OAN as long as you have a state agriculture license. * I would prefer to not be an OAN member for a variety of reasons, but we receive a significant discount on our company health insurance with membership...so I suffer the group. *OAN annual membership for my nursery (at our gross sales) is $1,219 per year (about $1200 too much). I also must donate $3,388.60 per year to the bureaucracy of the Oregon Dept. of Agriculture, and there I absolutely don't get my money's worth. 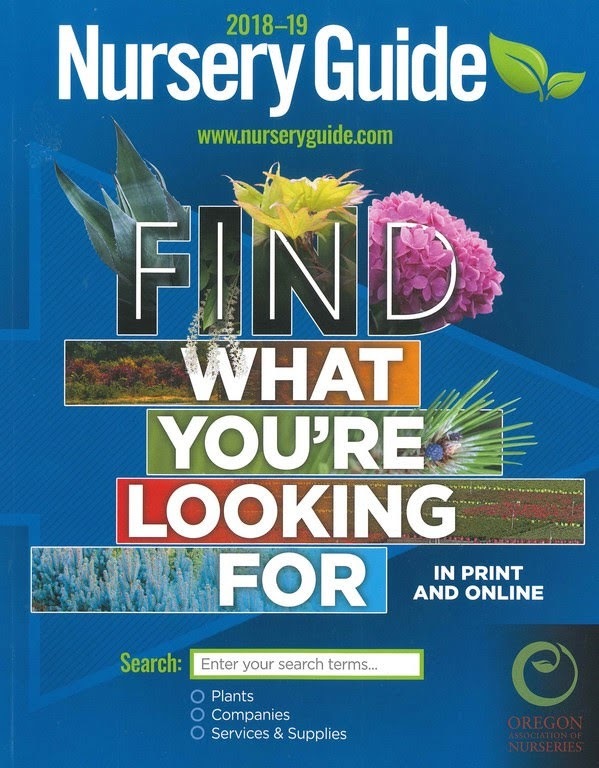 After I made sure that my name was speled right in the buyer's guide, I went to the plant listings where the plants are grouped into categories such as Conifers, Deciduous Shrubs and Broadleaf Evergreens, Shade and Flowering Trees etc. 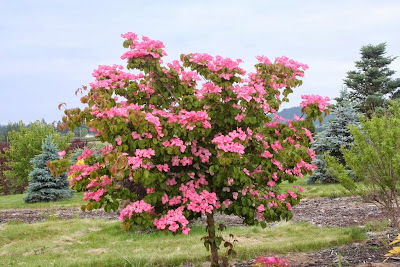 I found it curious (dumb) that Cornus kousa is in the shrubs section while Acer palmatum is considered a shade and flowering tree. Anyway, members pay a fee for each listing, $6.25 for 1, $4.75 for 76+, and I guess they justify the expense if they think it leads to sales. I don't think it does – I did it one year, 30 years ago – but some members list hundreds of times. For Cornus kousa 'Summer Fun' only two companies list it for sale, but I know for a fact that many other nurseries are producing it, some in huge numbers. On the other hand, 19 companies list Cornus alba 'Ivory Halo', a shrub that I couldn't even market one. One reason I went through the plant listing is to see who is growing what, to see who my competition is if I am growing it also. The other reason is to see if there are new plants that maybe I should consider growing. 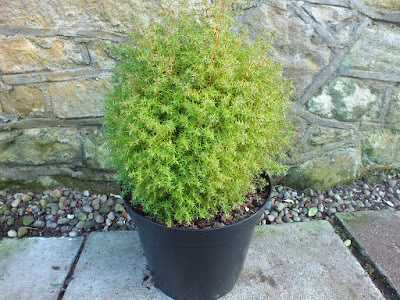 A conifer I wasn't familiar with is Chamaecyparis pisifera 'Tamu Himura' [sic]. Of course the name should not have a capital “H,” but then there are no nomenclatural heavyweights in the OAN anyway. 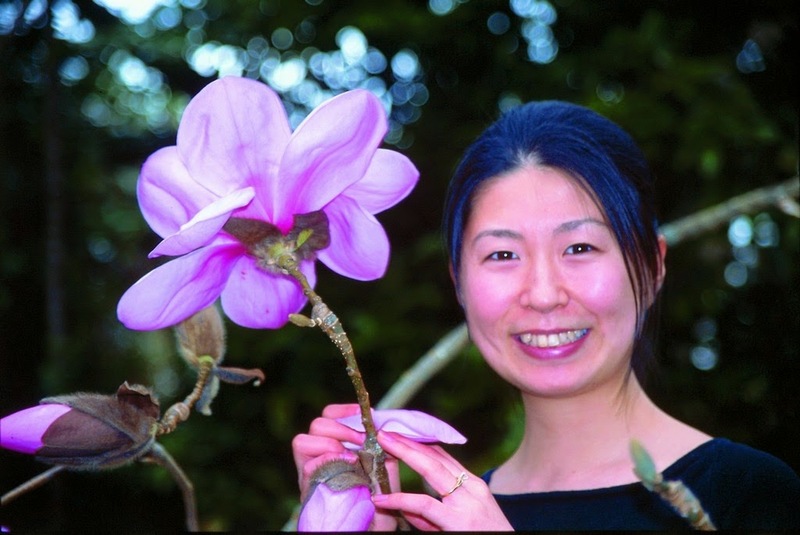 I looked up 'Tamu himura' on the internet and saw right away that it is not a plant that I would want. It probably roots easily and grows fast and would sell for cheap, so let the large nurseries crank them out and make their penny on the dollar. 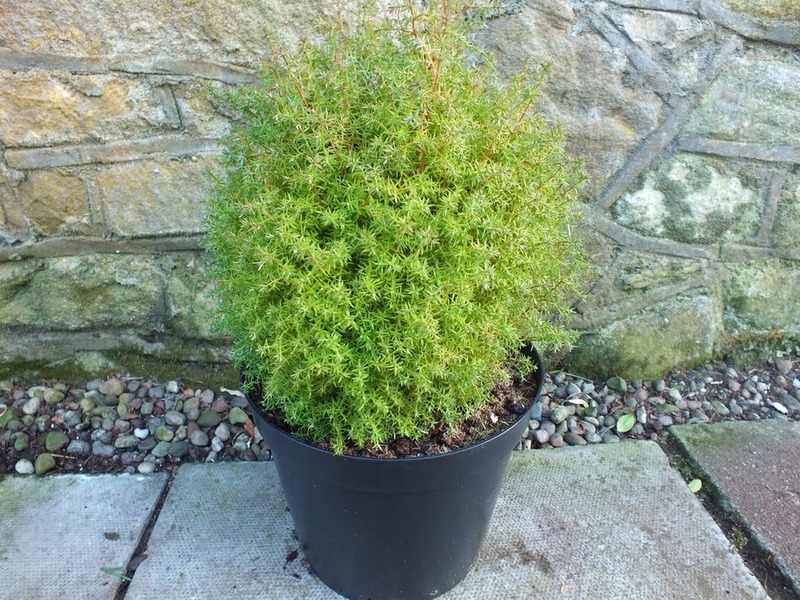 Another listing puzzled me – Thuja plicata 'Hogan' – as the implication is that the “Hogan Red Cedar” is a cultivar when in fact it is a variety of the Western Red Cedar. A small population exists in Gresham, Oregon just off of Hogan Road, and another small group grows about 8 miles away near the Columbia River at the western end of the Columbia River Gorge. The variety is characterized by a more narrow and compact growth habit than the type, and mature specimens are quite striking. Now, a cultivar or cultivars can arise from this variety, but the entire group cannot be considered a cultivar. 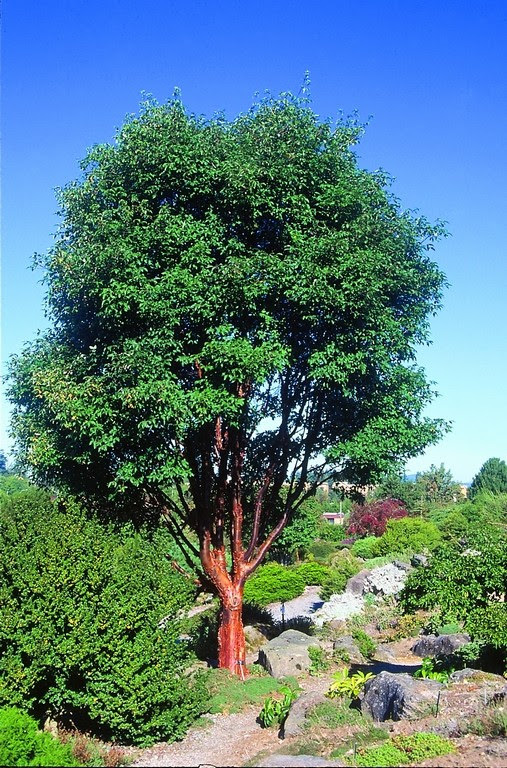 *I guess 'Hogan' could be a cultivar if someone selected a certain tree to propagate from, and then named that one 'Hogan'. Then you would have Thuja plicata var. hogani 'Hogan'. Is that what happened? 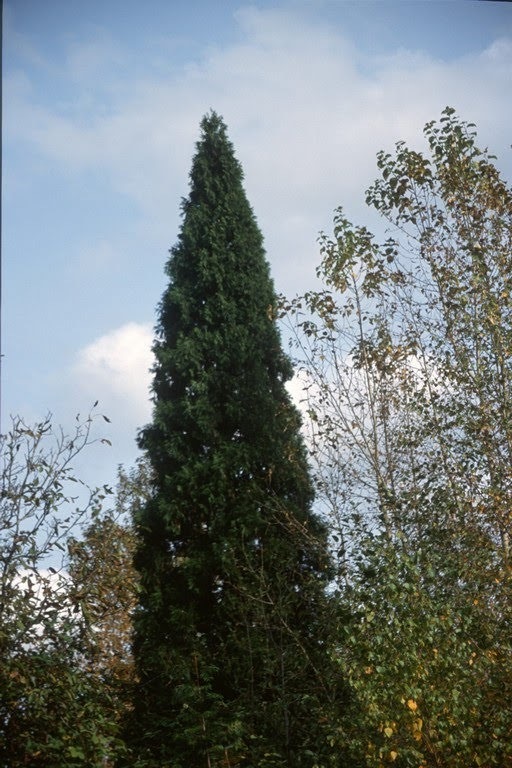 Conifer Grower Larry Stanley of (near) Gresham actually selected the most narrow specimen he could find in the grove which grows next to an abandoned brick factory, and he named it Thuja plicata var. hoganii 'Brick'. I received a start from Larry and I have it growing in the Flora Wonder Arboretum. It is easy to propagate, but again I doubt that I could sell it if I had more than a few. These days only three Oregon nurseries list Taxodium distichum 'Peve Minaret'. The cultivar skyrocketed to fame in America about 18 years ago, after I had first seen it at Linssen Nursery in The Netherlands. 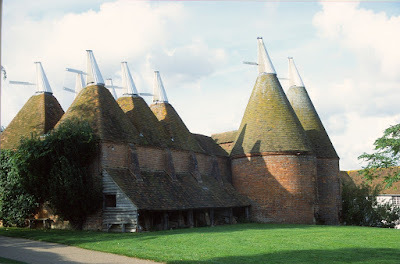 I was the first, or among the first to grow it here, and I produced a couple of thousand a year at the beginning. 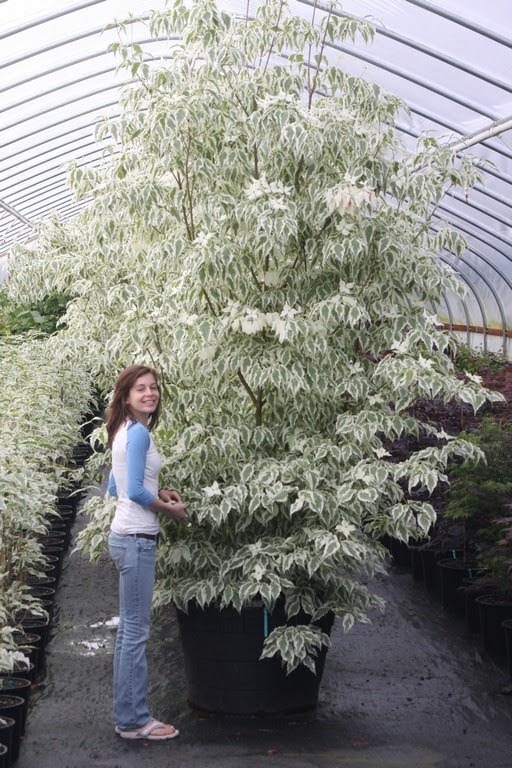 But in a relatively short time sales for liners waned, and sales for specimen plants never did take off. A year into the Recession (about 2009) I received an offer of a “great price” if I could take a “truckload quantity” of 1-gallon pots from North Carolina. I declined, but I still think it's a wonderful conifer and I don't know why the gardening public doesn't agree. 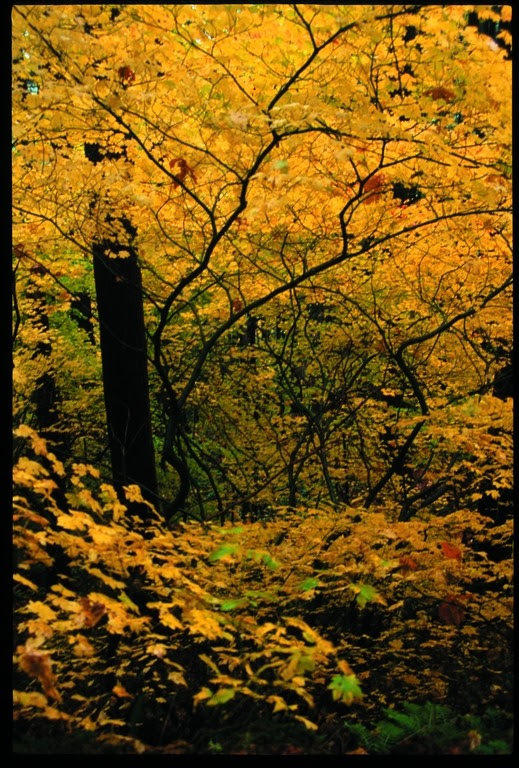 Maybe because it's deciduous (i.e. 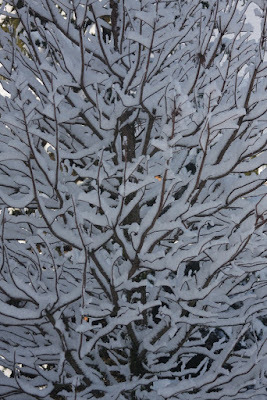 “dead” for half the year), but I think it is attractive in winter without its leaves. 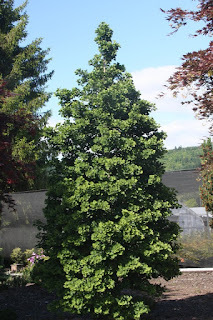 In the Hillier Manual of Trees & Shrubs (2014) it is described, “A small, slow-growing, upright cultivar with ascending branchlets and soft, rich green leaves.” I disagree with “small, slow-growing,” as my original start – from Kools Nursery – is already 22 feet tall (6.7m) at 18 years of age, and only 14 years in the ground. 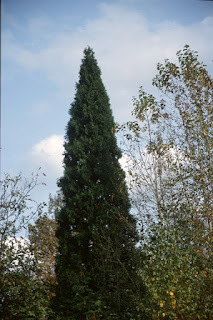 Only three nurseries list Sequoiadendron giganteum 'Glaucum'. I acquired the selection from England about 35 years ago and my original tree is the tallest plant in my Display Garden. 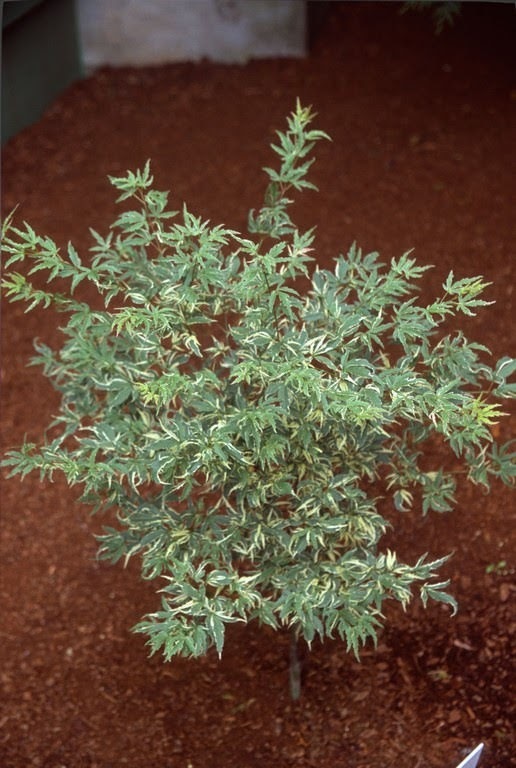 I doubt if 'Glaucum' was in Oregon before I began propagating it, but I didn't sell any to the three nurseries who now list it. I remember at Bedgebury Pinetum in Kent, England, looking across a valley of conifers and in the distance was a narrow spire of great height. I asked curator (at the time) Chris Reynolds what was the tree, and it turned out to be the 'Glaucum'. I was pleased with the answer because I love to promote narrow trees, and that you can have a vertical exclamation point without having a huge garden! 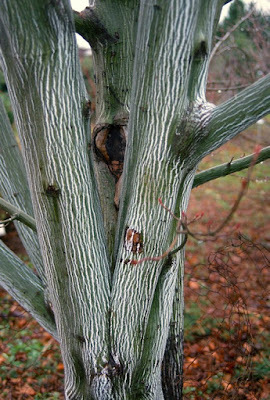 'Glaucum' is said to date back to 1860 and is perhaps of German origin. 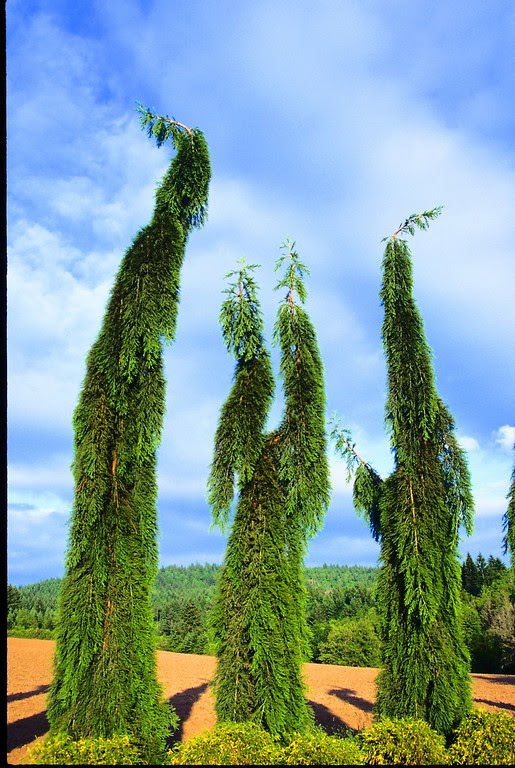 If so, that was fast, because Sequoiadendron was first brought to cultivation in Britain in 1853 by the horticulturalist Patrick Matthew of Perthshire from seeds sent by his botanist son John in California. 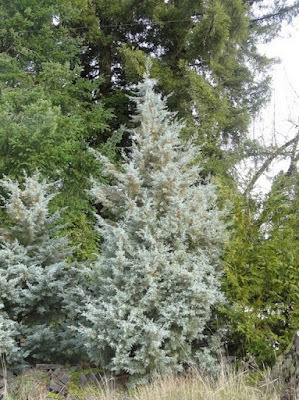 Many seedling Sequoiadendron display blue foliage, but to be the true 'Glaucum', they would have to look like the Bedgebury – and my – trees. In other words, a glaucous form may have been described in 1860, but I doubt that today's 'Glaucum' existed that early. 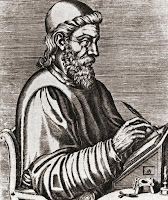 Bean doesn't mention 'Glaucum' at all, and Gerd Krussmann is of no use because he states that it is “exactly like the type, but with distinctly blue-green needles.” Rong, Gerd: the Bedgebury specimen proves otherwise. 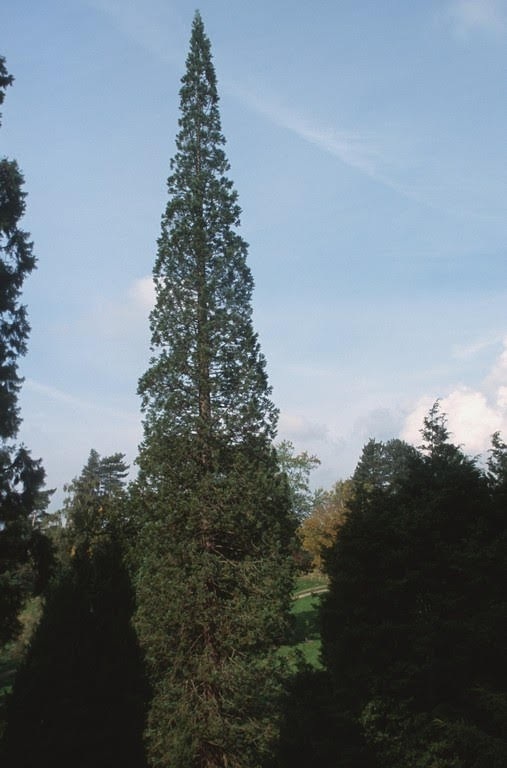 The American Conifer Society gave me a chuckle when they stated, “The blue giant sequoia is a very old cultivar in the nursery trade, first described 1860 by Christoph Friedrich Otto (1783-1856) in Hamburger Garden. The suggestion is that the wondrous Otto was describing plants four years after his death – look again at the dates! Also there are listings for Thuja occidentalis 'Linesville' and Thuja occidentalis Bobazam 'Mr. Bowling Ball' but they are the same plant. For the most part the listees are known to me and many were past customers back when we were more prominent in the liner business. And it brought back the history of many plants that we once had and sold, but they don't exist here any more. 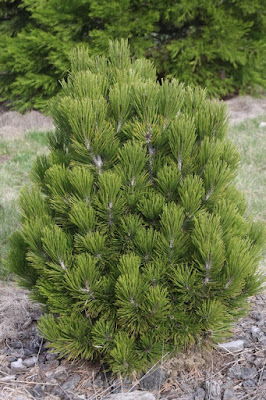 Some of these include: Tsuga canadensis 'Golden Splendor', Thuja plicata 'Can Can', Pinus virginiana 'Wate's Golden', Picea brachytyla, Juniperus procumbens 'Nana', Cupressus arizonica var. glabra 'Blue Ice', Cedrus deodara 'Deep Cove' and many more. The Deciduous Shrubs and Broadleaf Evergreens section contain far more plants unknown to me. Well, I know almost all of the genera, but the species or cultivar is what I'm not familiar with. And I admit to not knowing at all Krascheninnikovia lanata, Baeckea gunniana and Chrysothamnus nauseosus, the “Rubber Rabbit Brush.” The Krascheninnikovia is a plant in the Amaranth family (Amaranthaceae) known as “Winterfat” and it is a weed from western North America. Hey – that's where I live. I guess it's used in habitat restoration. 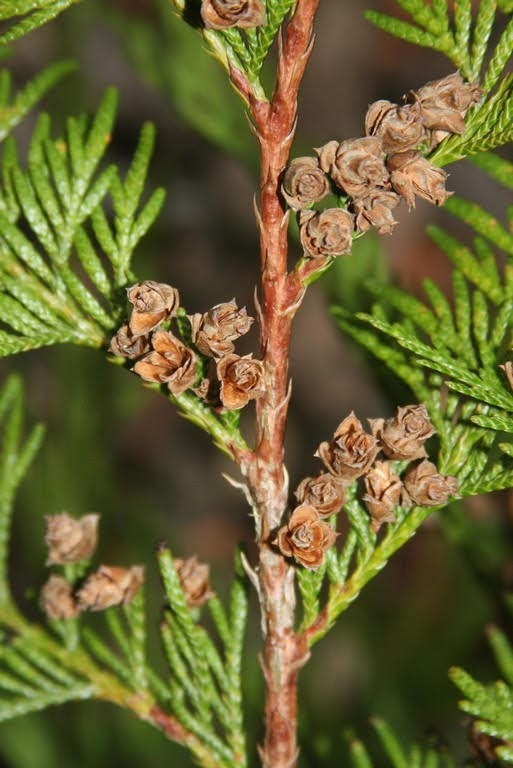 The Baeckea is an Australian bush with a tea-tree aroma when crushed. 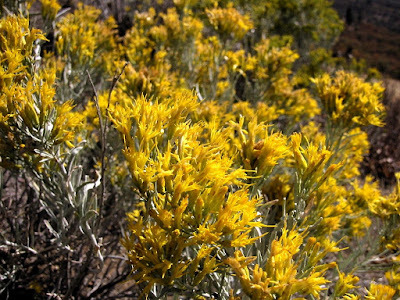 The Chrysothamnus is a North American shrub in the sunflower family and it too is native to arid regions of western North America. 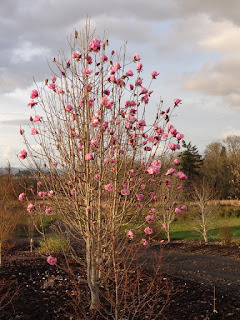 Magnolia – with most cultivars listed being “trees” – and Stewartia monadelpha and pseudocamellia also are strangely placed in the shrub section. There is very little that I grow from this section other than the above and I guess that defines my nursery. Sure, I used to putter with Buxus, Weigela, Hydrangea, Viburnum, Salix, Ribes etc., but anybody can grow that stuff so I had to specialize with higher-end plants, or with plants that aren't so easy to propagate. A common theme of shrub growers – at least in Oregon – is that a higher percentage of them went bankrupt when times got tough in our recent Recession. I don't consider myself a plant snob with my products and I am just trying to survive. The category Shade and Flowering Trees is my specialty, although many of them grow as shrubs. 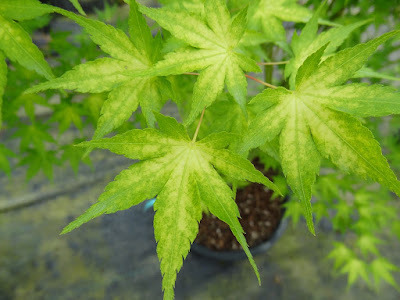 In the Acer palmatum section I am familiar with the 100-or-so cultivars listed with the exception of 'Ed's Carmine', 'Matthew', 'Sara D' and 'Okukuji nishiki'. Oops, the latter I have seen but don't have...I think. When I looked it up on the internet I was surprised that my company lists it and describes it and has a nice photo. Hey! 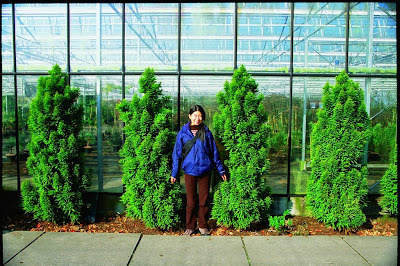 – I had better go check in the greenhouses and find it – and maybe I am losing my mind. 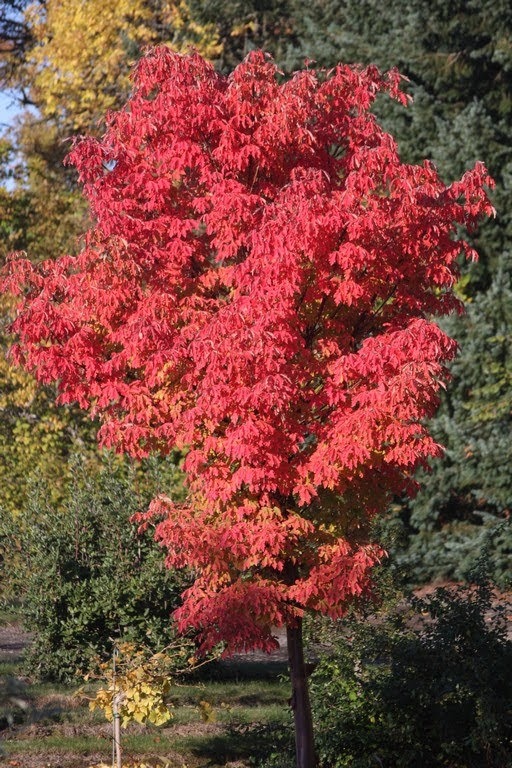 Early in my career Acer griseum was rarely encountered in the trade, and I remember seeing my first tree in the Hoyt Arboretum in Portland, Oregon. 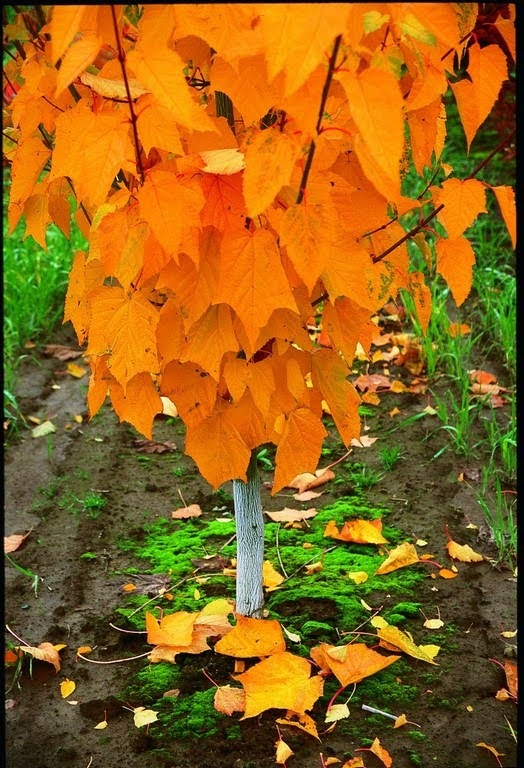 In 1901 E.H. Wilson was sent to China to acquire seed of the newly discovered “Dove tree,” Davidia involucrata, and his employer at Veitch Nursery told him to not waste his time on anything else. 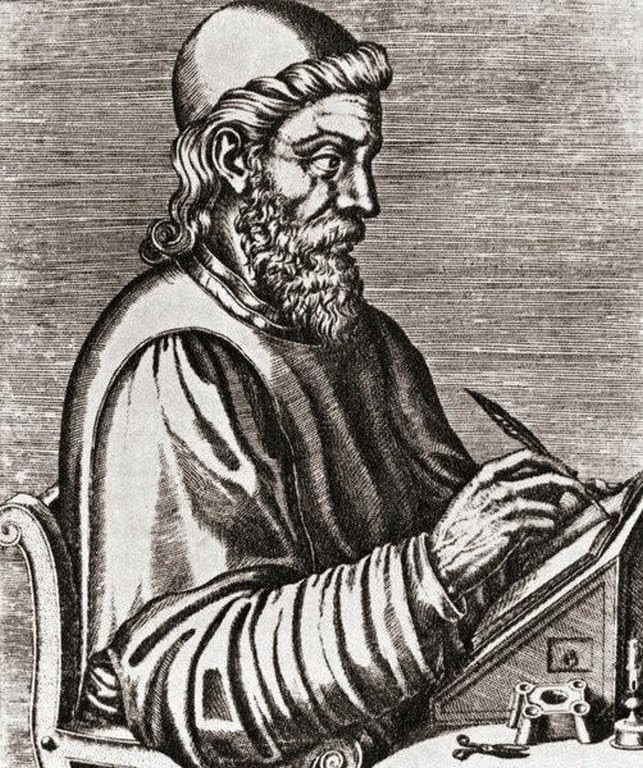 Wilson collected plenty of Davidia, but did waste his time discovering and gathering seed of Acer griseum as well. 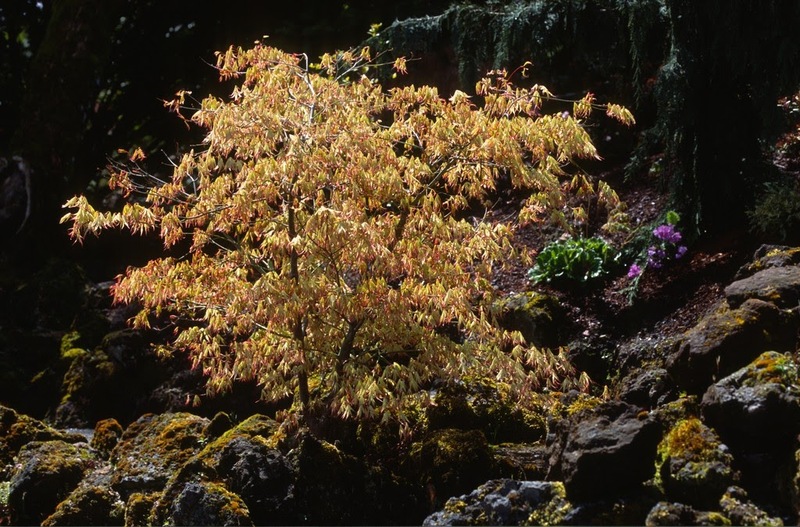 Hillier in Manual of Trees and Shrubs (2014) calls Acer griseum, “one of the most beautiful of all small trees.” Perhaps the most fantastic specimen of all is the old-timer at the Royal Botanic Garden, Edinburgh in Scotland. 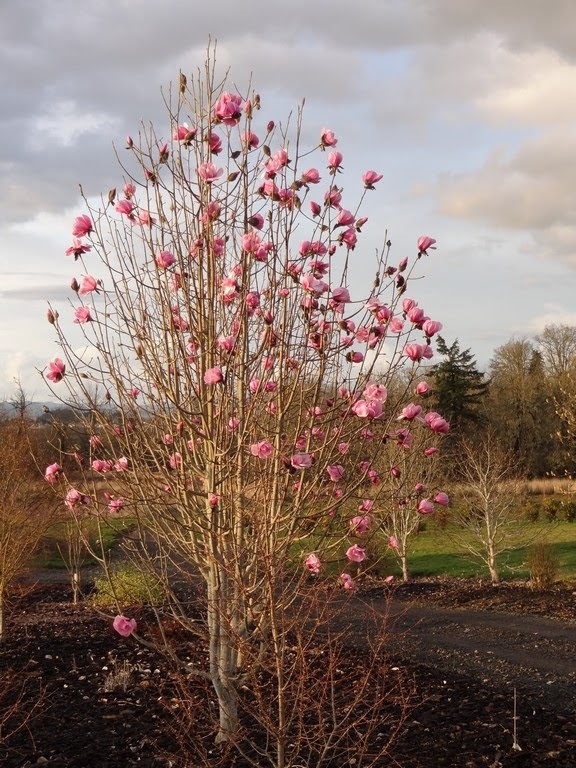 While once rare, a couple of Oregon nurseries figured out how to germinate A. griseum seed, and many thousands are produced each year. Of course the value of the species has declined, but I suppose that is a good thing, and now A. griseum is a commonly grown street tree. It is winter-hardy and tough, even when placed in full sun, and autumn color is brilliant orange-to-red. The OAN guide now has 36 nurseries listing A. griseum, so there could be well over a 100 of us growing it. How odd that A. griseum is everywhere now, but you rarely encounter Wilson's Dove tree in American landscapes. 43 nurseries, according to the guide, are growing Acer circinatum – the straight species, not cultivar selections. The species performs poorly in the American Midwest and East Coast, so they are all grown for local consumption. 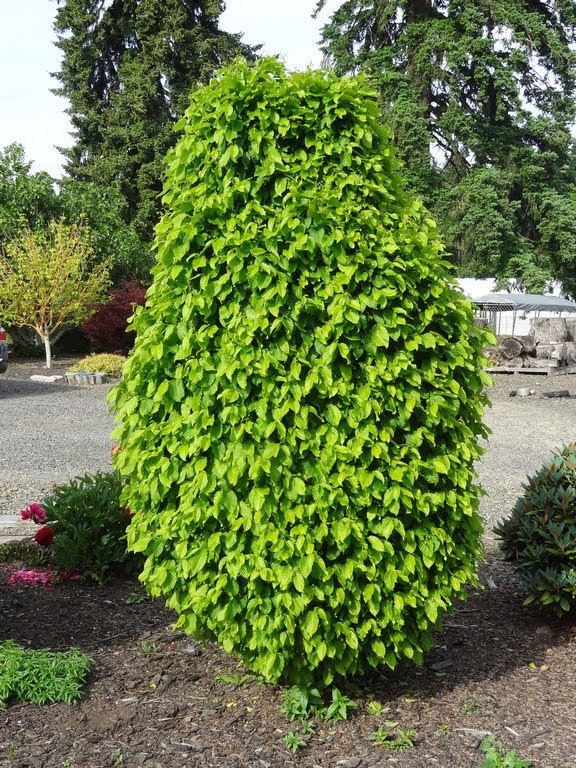 Virtually every bank and doctor's office uses the “vine maple” in their landscapes, often grown as clumps. The species tolerates dry sites and performs happily in deep shade as well as in full sun. 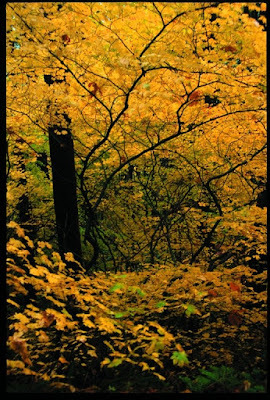 A. circinatum – so-named for its round leaves – was introduced by David Douglas in 1826, but my English friends tell me that autumn color isn't as brilliant in Britain compared to Oregon. Maybe that's why Hillier mentions only one cultivar of A. circinatum – 'Monroe' – and the OAN guide lists only two growers. 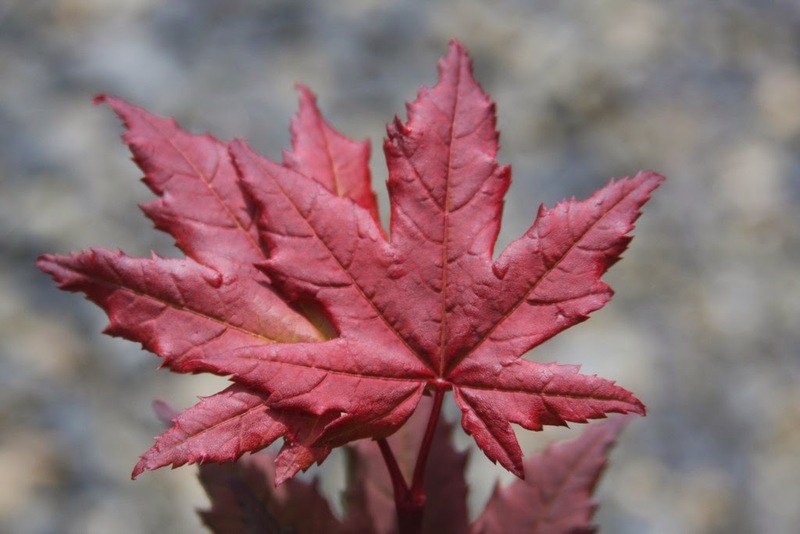 More surprising is that only one company lists the exciting 'Burgundy Jewel', the purple-leaf discovery of Gordy Halgren of Peacedale Nursery in Washington state. I know that 'Burgundy Jewel' is in England now because it was once featured in The Garden, the monthly publication of the RHS. Actually I was the one who sent it to maple specialist Karen Junker in the first place. Many nurseries are growing Carpinus betulus, especially 'Fastigiata' and the narrow 'Frans Fontaine', but only three list 'Columnaris Nana' which we grow. The latter is a dwarf, dense column, but like with kids, when you turn around you're surprised to see them taller than you. My oldest specimen is in my front yard and is 9' tall, but I'll have to move it this winter because I didn't give it enough room. We also grow C.b. 'Monument' which is similar to 'Columnaris Nana', but no other Oregon nursery lists it. 'Monument' was introduced by Viva Nord in Italy. Three companies are listed in the guide for offering Ginkgo biloba 'Jade Butterfly', but the name should be 'Jade Butterflies'. Another reason I don't advertise in the OAN guide – there are way too many mistakes. Word of mouth and our website are more effective marketing tools, and I suppose so too are our plant introductions. Like the three wise men from the east...just follow the shining star to Buchholz Nursery. In horticulture plants are grouped by family, then by various genera within a family, then various species within a genera, then cultivars or varieties or subspecies within a species. It's very simple, it all makes sense, thank you Linnaeus. In somewhat the same manner our English words descend from an ancient Proto-Indo-European tongue that died out thousands of years ago, in fact there's no written evidence of it. Etymologists (language experts) have created P-I-E words by working backwards from today's word, and step by step they travel back to time immemorial. 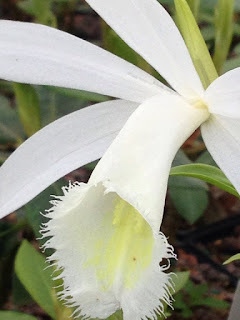 Consider the word white – an interesting color in horticulture. The P-I-E word for white was kwintos, then it went to the – also now dead – Proto-Germanic where it became khwitaz. Later it became hwit, an Old English word spoken by the Anglo-Saxons. 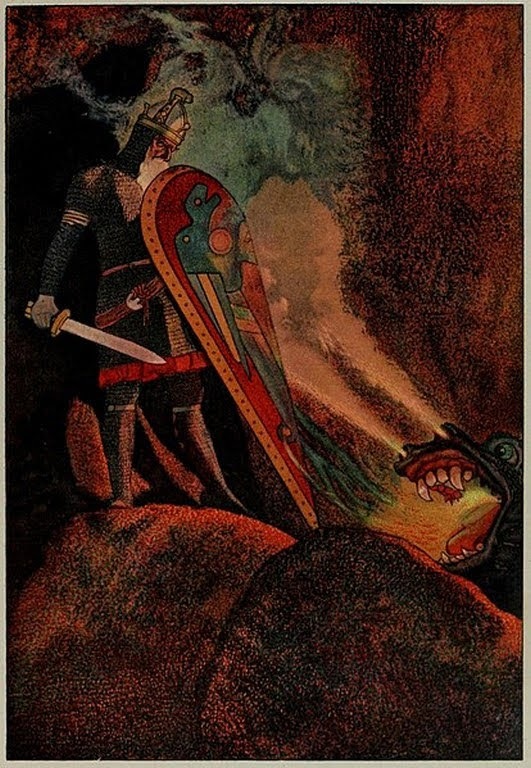 The Anglo-Saxons migrated to Britain from Germany between about 450-1066 and combined with indigenous British groups, and the language and culture produced authors like Bede and the unknown author of Beowulf. Through these works we have the first written evidence of the word that would become “white.” Today, variations of white can be found in 20 languages around the world, all with their root in P-I-E, and that also includes Sanskrit. 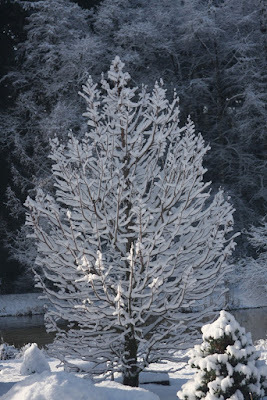 As a common name, white is used to describe species like “white fir” (Abies concolor), “white pine” (Pinus parviflora), “white spruce” (Picea glauca), “whitebark birch” (Betula utilis var. jacquemontii) etc. 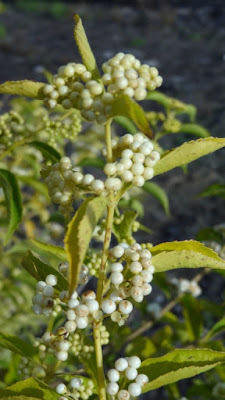 As a variety or cultivar name we have many 'Albas' and 'Leucos' as well, both meaning “white.” Thus we have a plant named Callicarpa japonica 'Leucocarpa' which is the “Japanese beauty berry,” and its fruits (carpa) are kwintos rather than the normal purple. 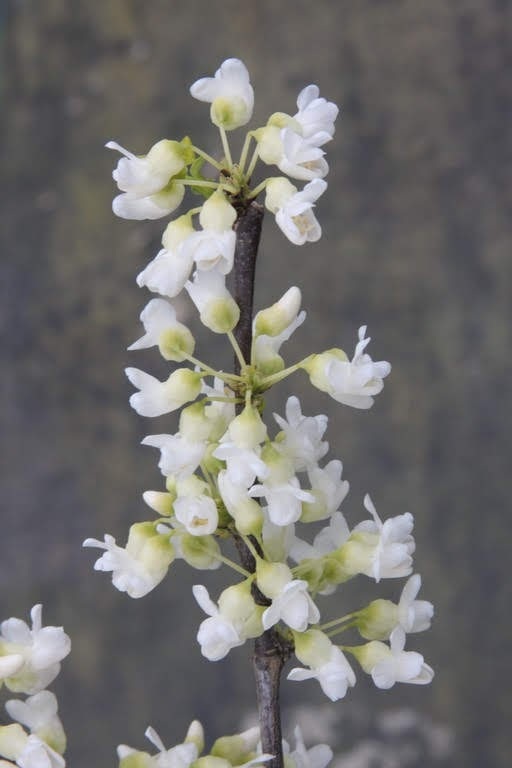 Also we have the “Europen Silver fir's” specific name of Abies alba, and a cultivar name of the “white hyacinth orchid,” Bletilla striata 'Alba', and for an “Eastern redbud,” Cercis canadensis 'Alba'. My teenage daughter is an exotic beauty, with being half American and Japanese, and she arises from her bed on Sunday at about 11 AM and parades through the house in her fluffy white bathrobe. If you peek into her room it is also white, nearly all of it, and I think she got her inspiration from an old Ginger Rogers/Fred Astaire movie. She even has plants in her room, all white-flowering of course, such as white orchids in white pots. Every once-in-a-while I'll place a blooming Pleione on her window sill, such as the pink-purple P. 'Irazu', to help keep her color-grounded, but she would much rather have the white P. formosana 'Clare'. I tease her about her predilection for white, but she points out that I drive a milk-white car, except that mine is not pure-white because it's always dirty – touché! The Sissinghurst castle and garden in the Weald of Kent was created in the 1930's by Vita Sackville-West, a poet, author and garden writer. The garden contains a series of “rooms” with different colors and themes, each enclosed with brick walls or hedges. The “white” garden has inspired many subsequent garden designers, although it was originally planted as a rose garden. 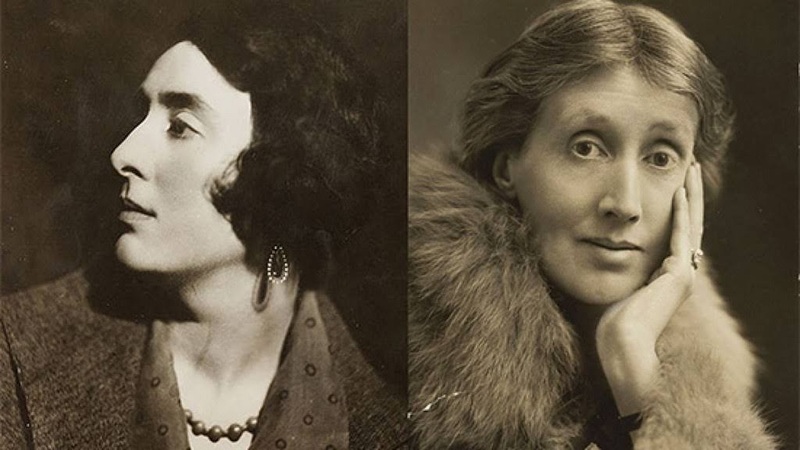 Actually S-W called it her grey, green and white garden, with “grey clumps of foliage, pierced here and there with tall white flowers.” Clearly the gardening world and tourists love her creation more than I do, but maybe that's influenced by my distaste for the inbred Vita and her lover Virginia Woolf's horse-like faces. Let's see what is white in the Flora Wonder Arboretum. 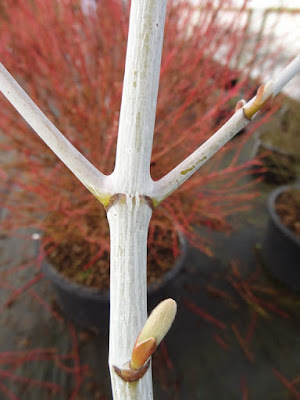 We grow a couple of Acer palmatums with white in the cultivar name – 'White Butterfly' and 'White Peaches'. 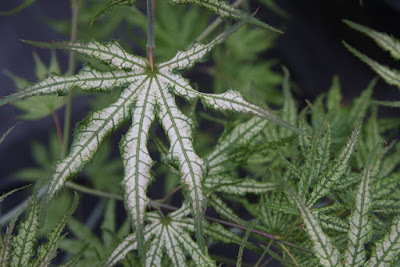 My start of 'White Butterfly' came from a maple collector in Pennsylvania, and I suppose that it originated from a scion shoot on the old cultivar 'Butterfly' that was a little more white than the rest of the tree. 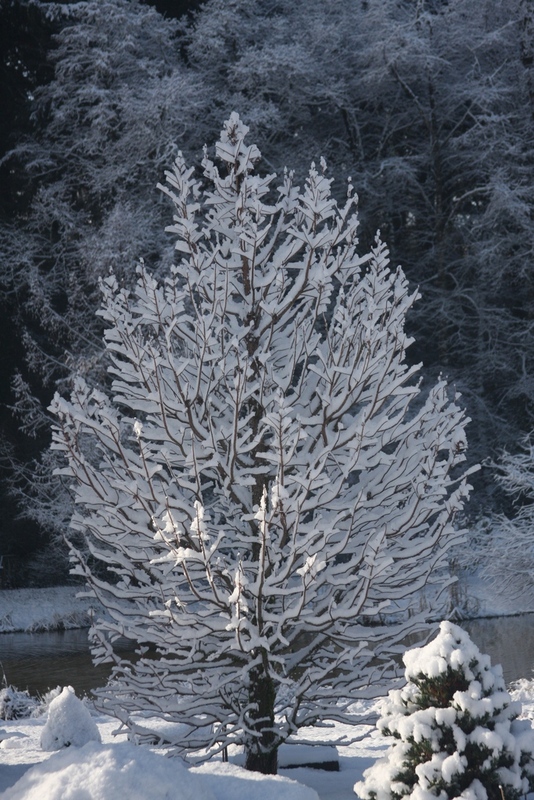 Or perhaps it was a seedling of a 'Butterfly' mother tree. 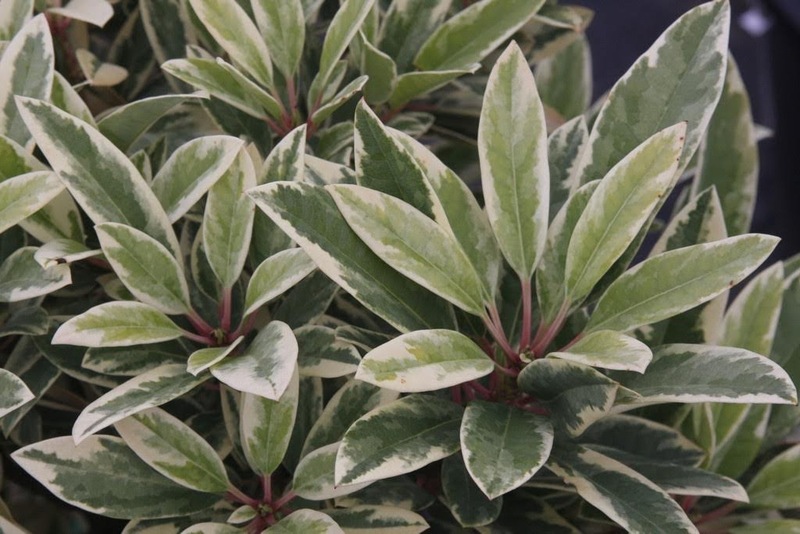 We discontinued 'Butterfly' because it was notorious for reverting, and besides the white variegation always looked dirty to me, especially after a hot summer. So far 'White Butterfly' has not reverted, but then I sell the trees when they are relatively young and I suppose that an old specimen planted out in garden would eventually revert. Renowned botanist and maple authority Piet de Jong gave a talk six years ago about Acer tegmentosum. He stated that there is no variation in its seedlings, therefore no cultivars. 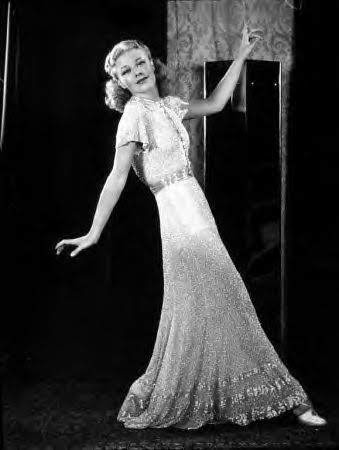 Hands immediately shot upward and some in the crowd cried out, “What about 'Joe Witt'?” It was selected for its extra-white trunk. 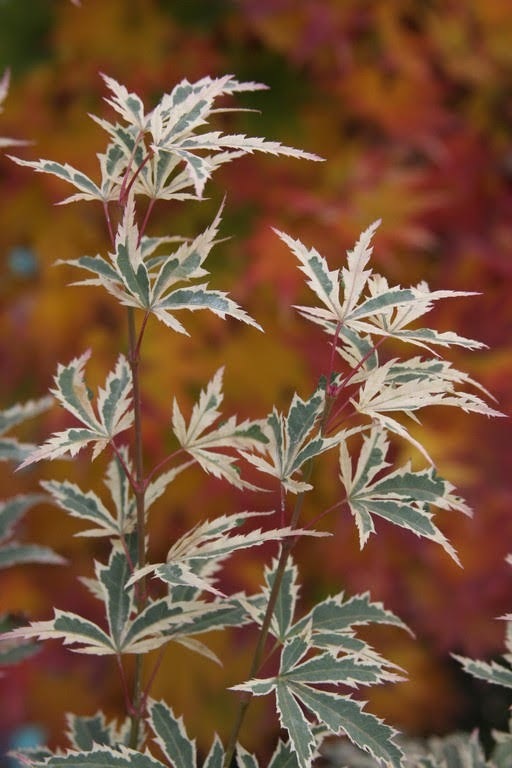 Acer tegmentosum 'White Tigress' is a possible hybrid and should therefore be listed as Acer x 'White Tigress'. It was named for the white striations on the trunk which remain noticeable and ornamental even as the tree matures. 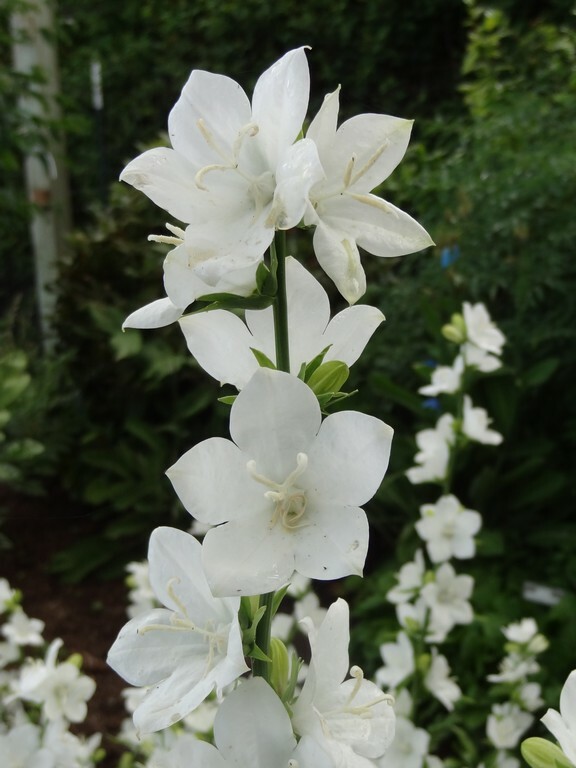 The seedling that became 'White Tigress' was obtained by Brotzman Nursery in 1962, and they named and introduced it in 1975, and the catchy name was meant to encourage use of the A. tegmentosum species in today's landscapes. Another maple with “white” in the cultivar name is Acer palmatum 'Shiro', which is the word for “white” in Japanese. 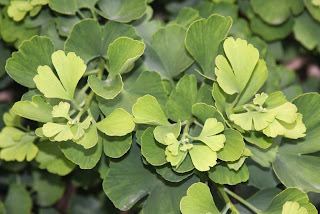 The foliage is light green in spring and early summer but there's nothing white about it. When the weather becomes hot the whiteness appears, as if the chlorophyll is bleached out from the center of the green leaf. It is a pleasing, though subtle effect. I'm not sure whether or not 'Shiro' is the same cultivar that Yano lists as 'Shirofu nishiki' in his Book For Maples. Campanula latiloba 'Alba' is the “Great White Bellflower,” and it blooms profusely in spring on 2' stems. The first year we grew it we experienced a wind and rainstorm and all of the flower spikes lay horizontally in disarray, so the second year we learned to tie it to the wall in our former basketball court. 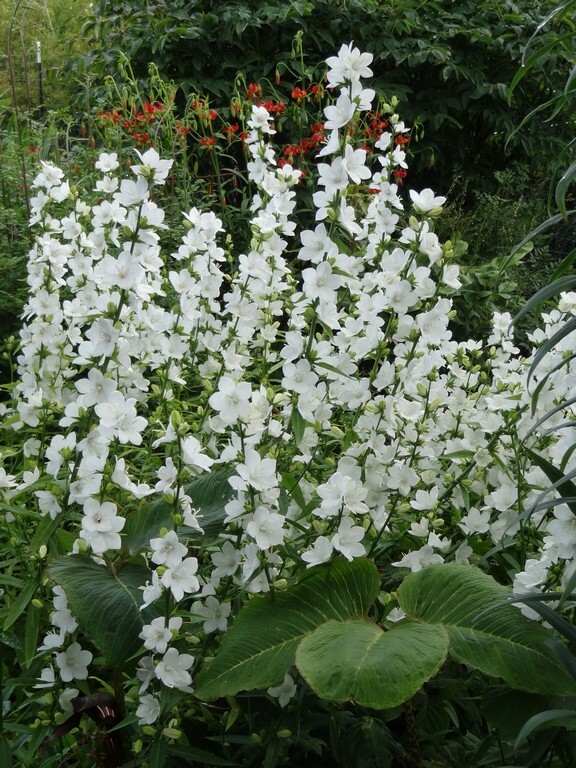 The word campanula is Latin for “little bell,” but the flowers are actually quite large on our 'Alba'. 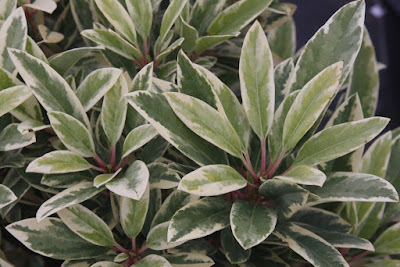 We grow a couple of Daphniphyllum cultivars with white variegated leaves, D. himalaense ssp. 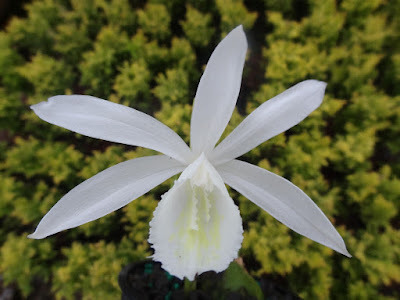 macropodum 'White Margin' and 'Yellow-White'. I received them from Japan but they probably have different names there, and I wished I knew them in Japanese. 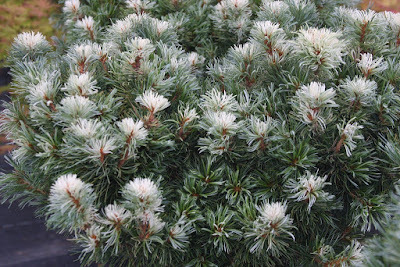 The genus is evergreen and the species is obviously native to the Himalaya. 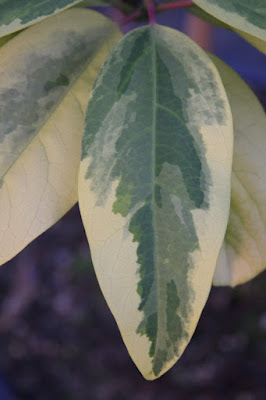 The genus name literally means “Daphne leaf,” but it is totally unrelated to Daphne, and the specific name macropodum means “large leaf.” I first encountered the species in Seattle at the University of Washington Botanic Garden where large green specimens were thriving as understory trees beneath the conifers. 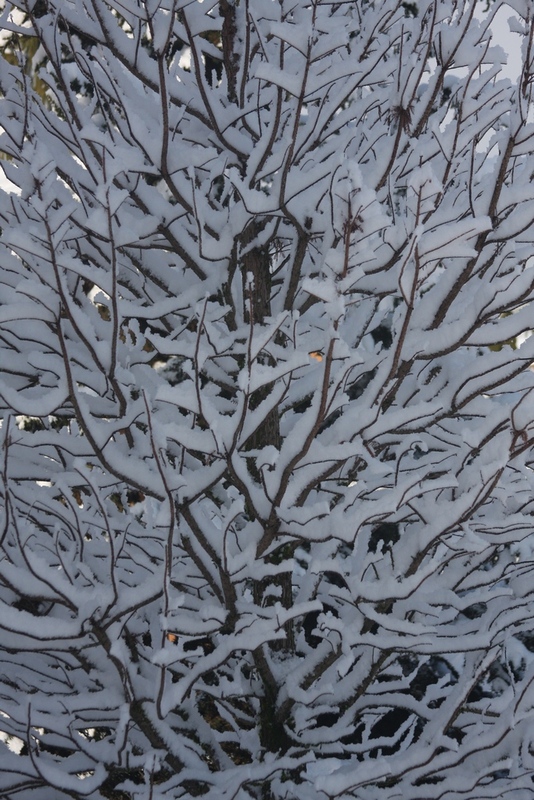 It was in winter and I first took them for Rhododendrons, but in any case I thought they looked particularly regal. The genus is dioecious and propagation is by seed, and we have had poor results trying to root them. 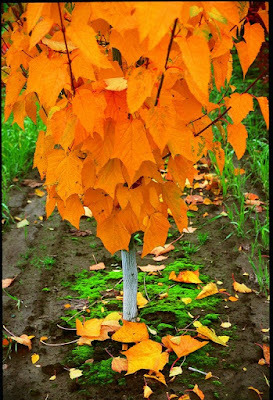 The variegated cultivars are then grafted onto seedlings with good results, but finding the seedlings is not easy to do. 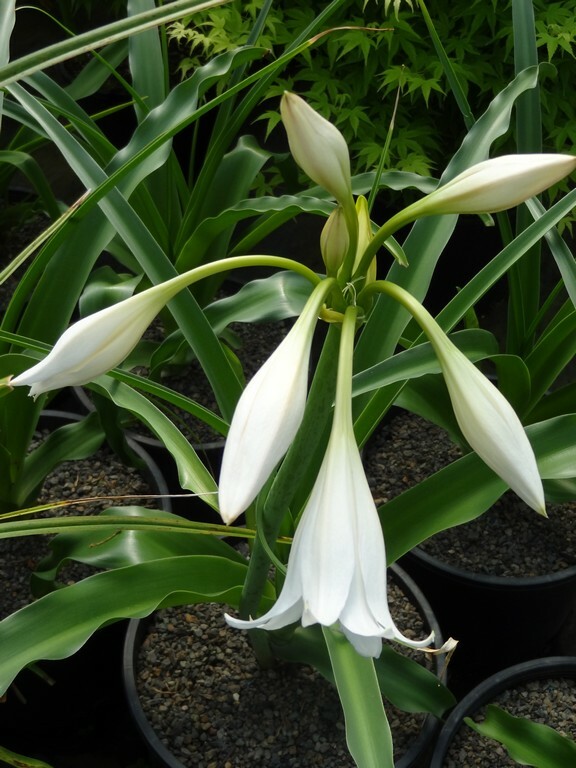 Crinum is a genus of perennial plants with lily-like flowers on leafless stems. 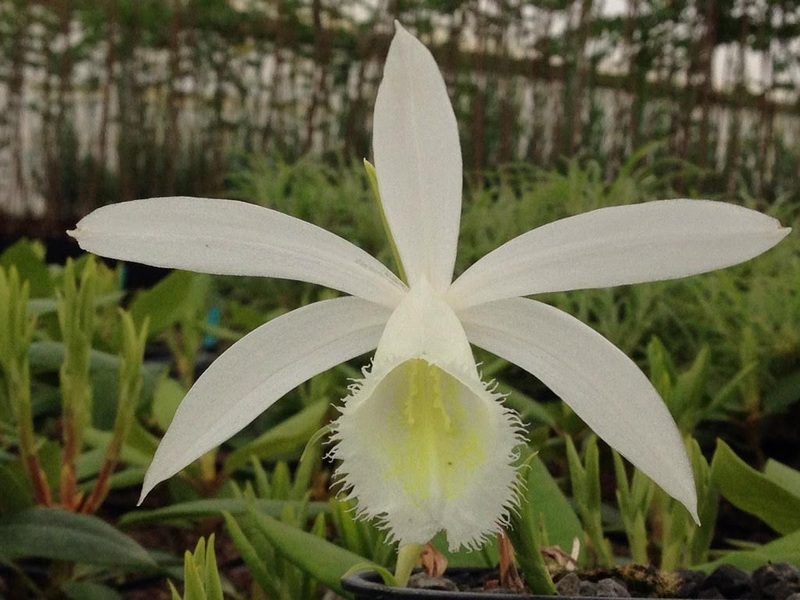 One of the most spectacular is 'White Queen' which originated as a cross of C. x powellii 'Alba' and C. macowanii. Crinums develop from bulbs and their foliage is unattractive frankly, but the pendant reflexed flowers of 'White Queen' are so purely white that one can tolerate the mop of foliage. 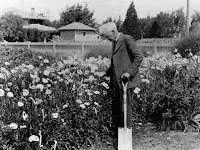 The hybrid was performed by the famous plant breeder, Luther Burbank (1849-1926), an American botanist, horticulturist and pioneer in agricultural science. I highly recommend visiting Burbank's garden if you're ever near the city of Santa Rosa, California. 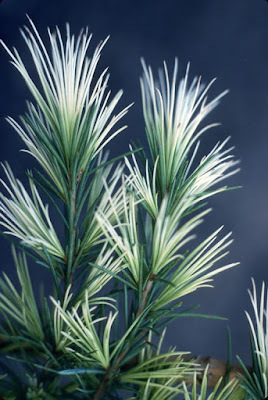 Leucodermis would imply “white skin,” but in the case of Pinus leucodermis the name refers to the new white shoots on an otherwise neat conical tree with green foliage. It is known as “Bosnian* pine” because it is native to the Balkans in Bulgaria, Greece, Yugoslavia and Albania. We have grown a number of cultivars since the nursery began 38 years ago, such as 'Compact Gem', 'Gnome', 'Schmidtii' and 'Satellit', the former three being more dwarf and compact than the type, while the latter cultivar is more narrow. 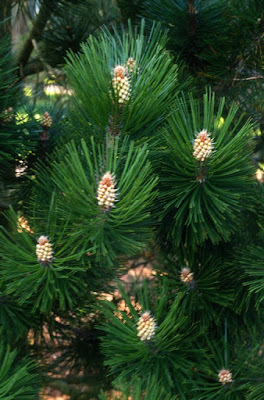 All propagate rather easily by grafting onto Pinus sylvestris rootstock, and they have been free from disease and pests. 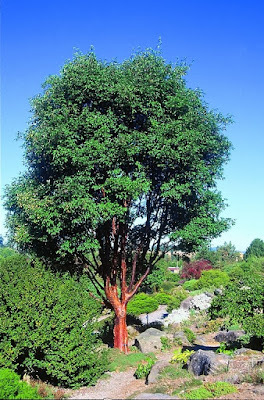 The formality of the cultivars would lead some to consider the species as boring, and I'll admit it is not my favorite either, but still they provide a dependable backbone in a landscape. 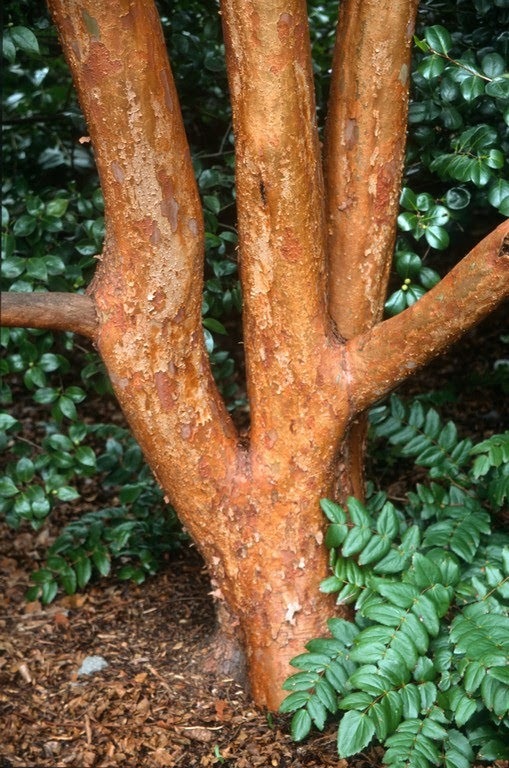 The classification of P. leucodermis is debatable with Hillier in Manual of Trees and Shrubs (2014) listing it as a variety of P. heldreichii, while Rushforth in Conifers (1987) considers them two separate species. Caulis is from Latin for the “stem or stalk of a plant,” so the name of Pinus albicaulis refers to the white-colored trunk. 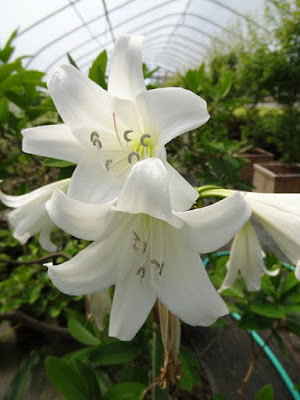 I've had only one cultivar in the collection – simply called 'Dwarf' – but it is no-longer being propagated. The species is of little ornamental merit, looking like a scrappy version of Pinus flexilis, but they can look magnificent in their natural mountain setting. 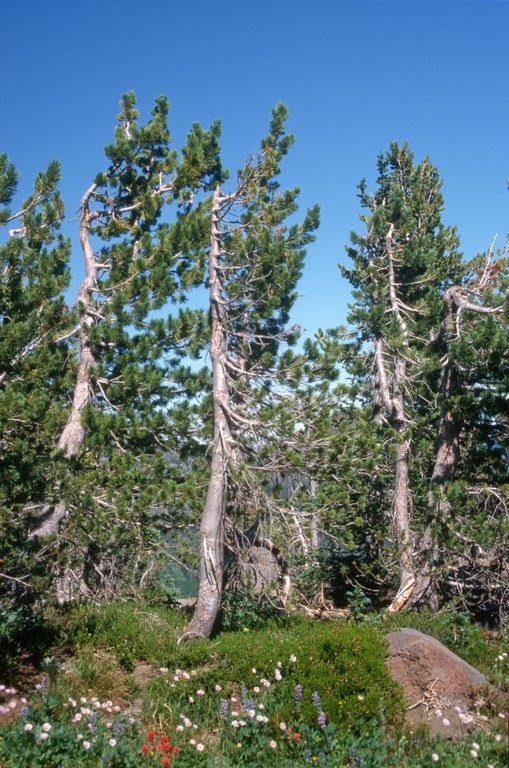 P. albicaulis is native to the Rocky Mountains, the Sierra Nevada and the Cascades, and is often the last tree at timberline, therefore you often see them in the low-spreading krumholtz form due to extreme exposure. 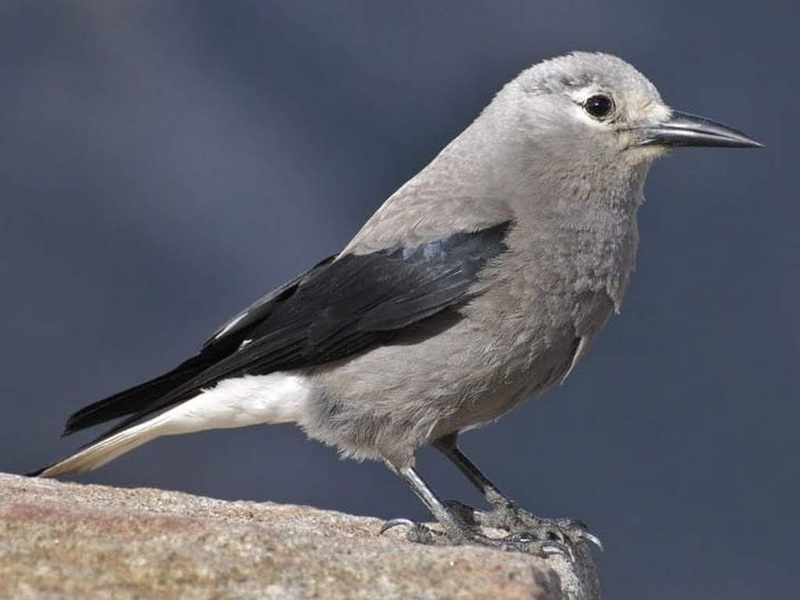 The whitebark pine is an important food source for the Clark's nutcracker* (Nucifraga columbiana). One bird can cache up to 100,000 seeds each year to be used as food during times of food scarcity, and these storage places can cover a large area. 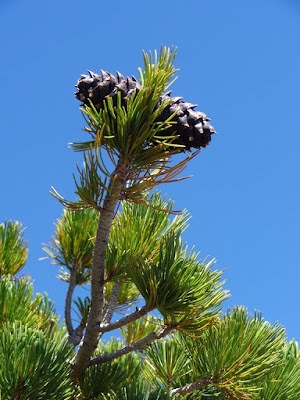 When those seeds that are not retrieved germinate, it explains why you often see the pines growing in clumps. 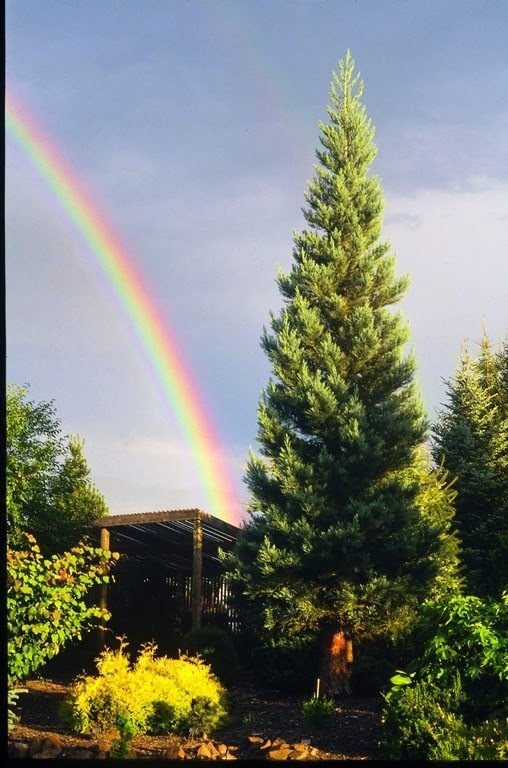 The champion P. albicaulis tree is located in the Sawtooth National Forest in Idaho and is 65' tall, with a 27' crown spread and a circumference of 22'. *The Clark's nutcracker is in the crow and jay family, but the first time Captain William Clark of the Lewis and Clark Expedition saw one (August, 1805) he thought it was a woodpecker. Synthyris missurica ssp. 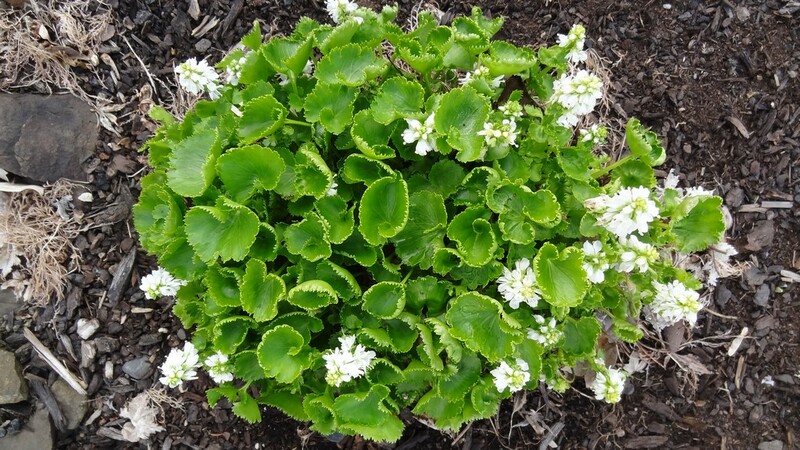 stellata 'Alba' is the white-flowered form of the “Columbia Kittentails,” a perennial in the Scrophulariaceae family. 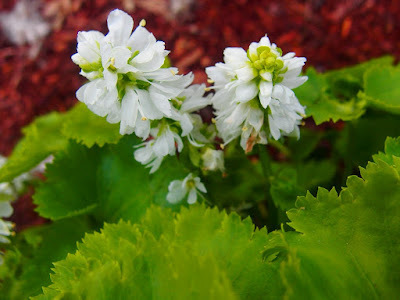 Normally the species blooms (in April) with lavender-to-purple flowers so the white form is rare. Even when not in flower the two-inch glossy leaves are evergreen, and so the plant always looks neat. The generic name Synthyris occurred in 1933 when it was separated from the Veronica genus, and is derived from syn (together) and thyris (little door or valve) in reference to the capsules of the plant in fruit. The first collection of Synthyris was made on the Lewis and Clark Expedition in 1806 in Idaho. 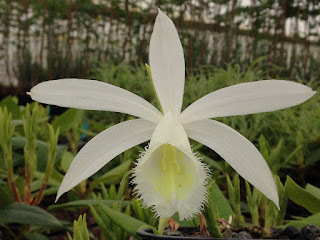 I'm happy to have my one plant in the collection, but it is something that we have never decided to propagate. Muhlenbergia capillaris is the “Muhlygrass,” an ornamental grass in the Poaceae family. Normally the flowers are pink to pinkish-red, but the cultivar 'Alba' displays white autumn flowers. The grass is native to western and central USA and is considered easy to grow and is known to tolerate drought and air pollution. I love it for its airy flower-cloud which lasts for a couple of months. 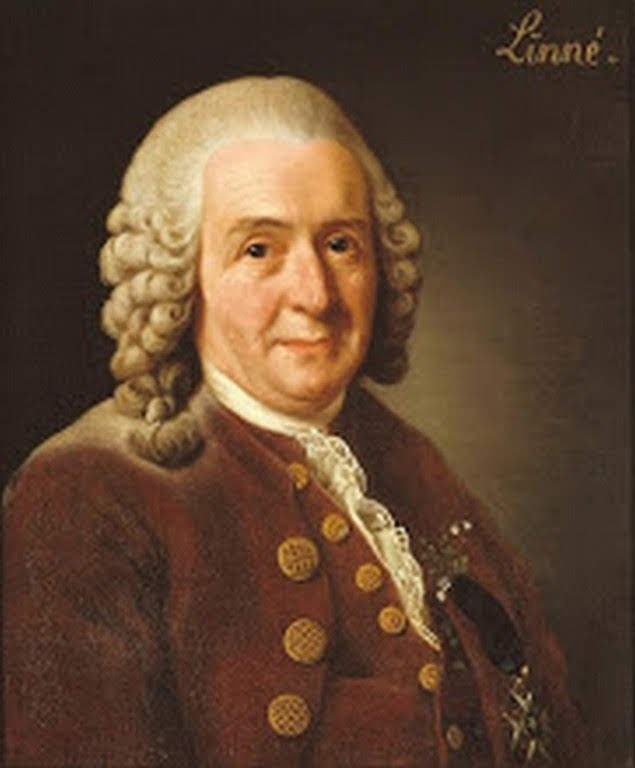 The generic name honors Gotthilf Muhlenberg (1753-1815) who was a Lutheran pastor and amateur botanist. How interesting that “men of the cloth” often turn to plant collecting and/or botany. Are they bored with their celestial pursuits – some missionaries never convert even one soul – or do they feel compelled to elucidate and celebrate the wondrous works of God through nature? In any case it would indicate that they have “time on their hands,” but what better way to spend that time? 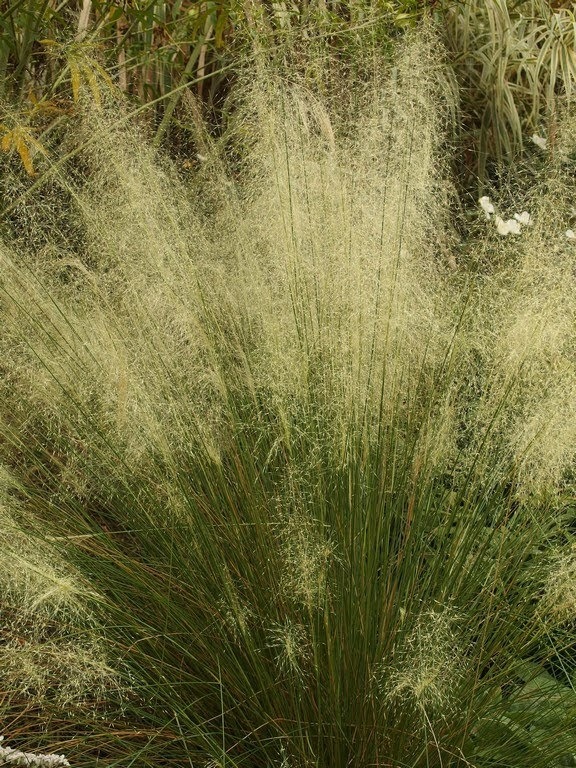 I don't really know what it's with me, that I find myself collecting the rare white-form of Synthyris and then also the white-flowered form of Muhlenbergia instead of the normal pink? White is pure, purity...I guess. Buchholz Nursery's reputation was built on offering Japanese maples and grafted conifers, and now, 38 years later, we find ourselves as purveyors of hardy orchids. It keeps the nursery fresh, and as I've said before, I know of no other wholesale nursery where a customer can have so much fun.